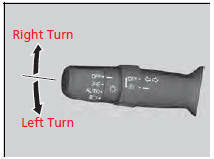 The turn signals can be used when the power mode is in ON. When you lightly push up or down and release the turn signal lever, the exterior turn signals and turn signal indicator blink three times. This feature can be used when signaling for a lane change.